What's so interesting about stormwater? All modern cities—characterized by paved roads, rooftops, parking lots, and impacted soils—have serious problems with stormwater, and those problems are only growing as urbanization proceeds and climate change causes more severe weather events. Historically, cities have used gray infrastructure to manage stormwater; this is not only costly but causes an array of environmental problems. Proponents have long advocated using a green infrastructure approach, which has numerous advantages over traditional gray infrastructure systems. Nevertheless, very few U.S. cities have invested in green infrastructure on a significant scale. The question, then, is why have cities resisted adopting green infrastructure, and what would it take for them to choose a landscape-based approach to stormwater management over a conventional engineering solution? To answer this question, I studied a city that recently decided to embrace green infrastructure in a big way: Philadelphia. I argue that (1) new stormwater regulations and the 1990 withdrawal of federal funding changed the constraints and incentives for the city to make green infrastructure viable, particularly for a cash-strapped city; (2) a policy entrepreneur in the Philadelphia Water Department did two key things in preparation for a future policy window: he created an office organized around watersheds, and began redefining the problem; and (3) the policy entrepreneur capitalized on a regulatory policy window, the Combined Sewer Overflow Long Term Control Plan Update, that garnered momentum from the city's decision to "re-brand" itself as a green city and galvanized support for the $1.6 billion plan for green infrastructure across the city. These conclusions are supported by evidence from Philadelphia's decision to adopt a green infrastructure approach to manage runoff. Finally, I discuss the implications of these findings and make recommendations for the implementation of the plan. My research also got some press on the MIT Environmental Policy and Planning blog. 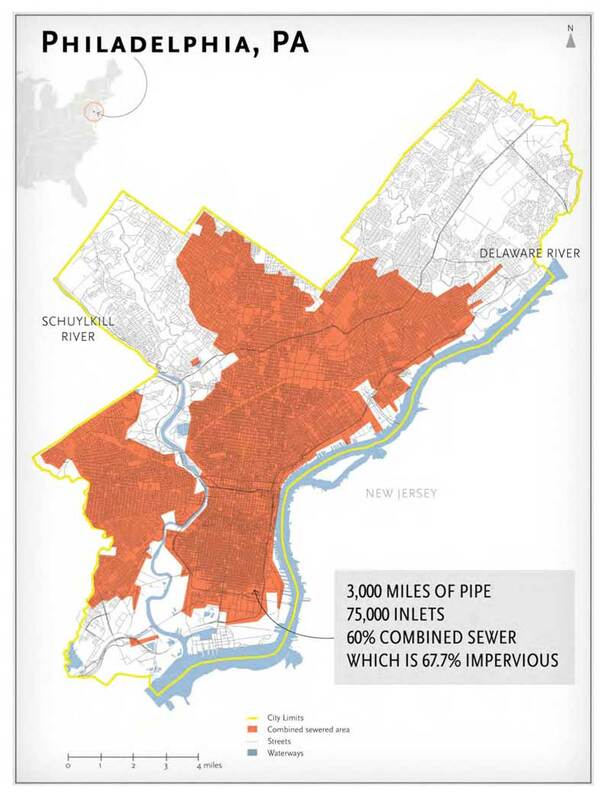 Approximately 67.7% of the city of Philadelphia is covered by impervious surfaces, meaning that rainwater cannot permeate two-thirds of the city and instead turns into stormwater runoff that flows into the combined sewer system. Philadelphia's aging sewer system overflows after as little as one-tenth of an inch of rain, washing raw sewage, urban runoff, and detritus into the rivers.